Participants of the 1st ICReDD International Symposium. The Institute for Chemical Reaction Design and Development (ICReDD) held its 1st international symposium at Hokkaido University’s FMI Hall on March 12th and 13th, welcoming more than 130 participants from both Japan and overseas. ICReDD was launched in October 2018 as part of the World Premier International Research Center Initiative (WPI) by the Ministry of Education, Culture, Sports, Science and Technology (MEXT) of Japan. The institute aims to understand complex chemical reactions in-depth and to accelerate the efficient development of new chemical reactions. To start off the symposium, opening remarks were given by Junji Nishii, the Executive/Vice President of Hokkaido University, Akira Ukawa, the Program Director of the WPI, and Tadatoshi Kaneko, Director of the Office for Basic Research Programs Basic Research Promotion Division of the Ministry of Education, Culture, Sports, Science and Technology (MEXT). 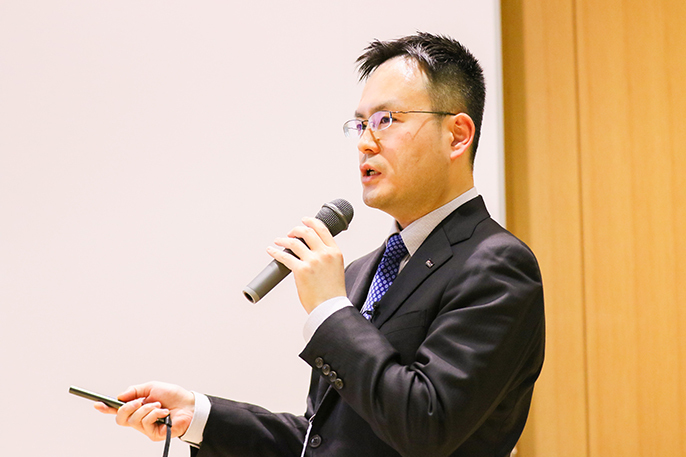 In their speeches, Nishii emphasized the importance of active participation by young scientists for the success of the new institute, Ukawa gave an overview of the WPI program, and Kaneko expressed his hope for collaborations between WPI centers throughout Japan. Center Director Professor Satoshi Maeda giving a talk. Following the opening remarks, ICReDD Director Professor Satoshi Maeda introduced the new institute. He discussed moments in history when major developments in chemistry changed people’s lives while mentioning that “the development of new chemical reactions has been labor-intensive and time-consuming.” ICReDD aims to fundamentally change this process, and speed up research and development times by combining computational science, information science, and experimental science. Maeda then introduced a key computational methodology called Artificial Force Induced Reaction (AFIR), which helps scientists predict and discover new chemical reaction pathways. In the following sessions, ICReDD principal investigators Benjamin List (Max-Plank-Institut fur Kohlenforschung), Alexandre Varnek (Universite de Strasbourg), and Hajime Ito (Hokkaido University) presented their work, with additional talks from invited speakers Kenichiro Itami (Director of the Institute of Transformative Bio-Molecules (ITbM), Nagoya University), Shin-ichi Minato (Kyoto University), and Hisashi Yamamoto (Chubu University); each talk was followed by an active Q&A session. At the end of the two-day program, Kazuyuki Tatsumi, Program Officer of ICReDD, gave the closing remarks. A reception was also held on the first day to celebrate the inaugural symposium and enhance deepen the relationships between the participants from different fields. The ICReDD plans to hold this symposium annually.